At present, farmers in Holland and the UK are testing “robocrow” – a new method for scaring birds away from their crops. Essentially, robocrow is like a laser-centric version of a scarecrow. 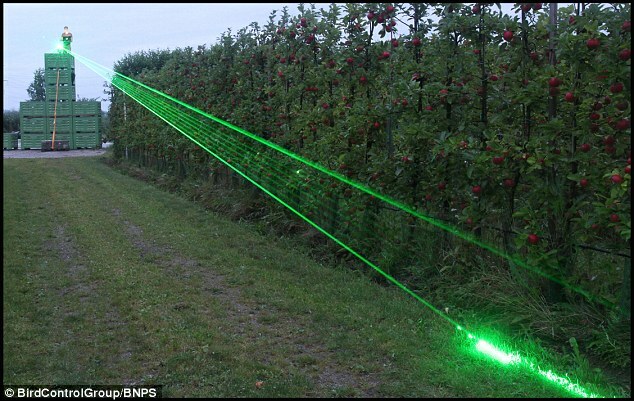 A digital system mounted atop a tower shoots green motion-activated multi-pronged laser light at birds (see picture below) to startle and frighten them away from pecking, nipping, or piercing farmers’ fruit and other foods. The saliency of the device appears high, as the Director of the Dutch Centre for Agriculture and Environment reminds us that “the smallest hole in a pear means it can rot and infect the whole crate.” Interestingly, the farmers that have trialled robocrow have reported that the spoiling of crops due to avian interference were almost entirely eliminated. Looking at these two statements together, the stakes of robocrow appear to be elevated from a mere gardening novelty to something that could deeply alter the markets and market logics that surround the circulation of grown-from-the-ground food worldwide. From a technology and R&D side, I also found the brief comments about the development of robocrow interesting. The farming and policy communities appear heavily concerned with the disturbance of tools and techniques, such as robocrow’s “lightshow,” used to scare birds away from crops. With this in mind, I found it rather ironic that the previous way birds were scared away (through the shooting of canons and the production of other loud noises) was not met with more critique, or that it wasn’t replaced more quickly. Additionally, I also find it interesting that the ecological impacts of robocrow appear to go under-discussed, or under-evaluated. The Director of Holland’s Centre for Agriculture and the Environment is quoted as saying, “We tested it on crows – jackdaws and rooks – and they were all scared away. They tend to be the smartest birds so if it works on them it should work on other birds.” Furthermore, I also found it interesting that earlier iterations of robocrow were hand-held laser devices that people roaming through the fields would flash and shine to shoo birds away. It’s interesting to think that when moving toward the height of automation is often the first step, or primary goal, of “going robotic” that this particular type of technology began hand-held, which seems to require much more human attention and capital than would be thought of as “efficient” for prototyping. Overall, to me, the attention to light pollution, the Director’s quote, and the human-centered iterative origins of robocrow communicate strong concern with the human elements of agrarian life: i.e. communities, farmers and bringing fruit to-term, harvesting, and selling it for sustenance or profit. Such attention seems to avoid or gloss over how lasers might impact the ecology of plants, or that less-intelligent birds might not actually be warded off by the system because they do not react to light in the same way. Put directly, it appears that all of the human elements of robocrow are at the centre of its public discussion in the widely read, accessible medium of The Daily Mail (where the article was originally published), which raises the (admittedly) broad question: what about the environment? In the story of a technology that appears to be all about the environment (birds eating plants, how plants grow, etc), it is interesting that the ecological elements of this story appear to take a backseat. What do such narrative practices tell us about publics’ interest in the environment? What does it say about what knowledge production agencies (such as news media) think publics want to know about environments? The complicated nature of this conversation, and others dealing with people, plants, and profits are well-documented in STS literature (see: Cori Hayden’s When Nature Goes Public for an excellent example); and I am looking forward to reading how such discussions might increasingly analyze the relationship between digital cultures and environments in the coming years.